The United States Congress designated the Unaka Mountain Wilderness (map) in 1986 and it now has a total of 4,472 acres. All of this wilderness is located in Tennessee and is managed by the Forest Service. This Wilderness spills down the western slopes of the Unaka Mountains, which form part of the boundary between Tennessee and North Carolina. Birch, beech, maple, oak, cherry, poplar, hickory, pine, hemlock, spruce, and fir forest the slopes. Some of the hemlocks are almost 100 years old, but loggers worked their way through most of the original forest prior to designation. The deciduous trees paint a glorious fall tapestry best appreciated from high elevations such as the 4,800-foot Unaka Mountain Overlook. More than 10 waterfalls tumble down 20-foot-plus drops along seven major streams. The Limestone Cove Trail, about 3.2 miles total, climbs steeply then levels off slightly along an old logging road to the top of Stamping Ground Ridge. The Rattlesnake Ridge Trail descends for three miles across the Wilderness from near Unaka Mountain Overlook. 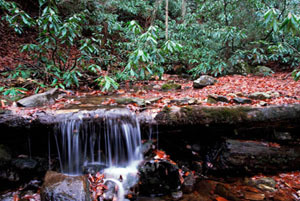 Rock Creek Falls Trail is a moderate 2-mile hike to two cascading falls. Foot and Horse access are allowed at Limestone Cove and Stamping Ground Ridge. Planning to Visit the Unaka Mountain Wilderness? How to follow the seven standard Leave No Trace principles differs in different parts of the country (desert vs. Rocky Mountains). Click on any of the principles listed below to learn more about how they apply in the Unaka Mountain Wilderness.